From basketball player to walk-on to college scholarship to starter to all-conference…to the NFL. 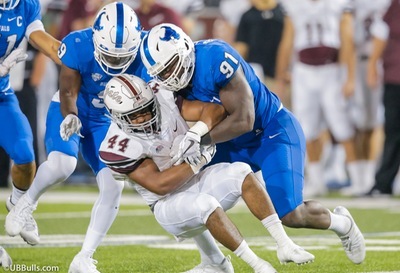 The University at Buffalo defensive end is anxiously waiting to know where he’ll be headed. It doesn’t matter to him if it’s as a late round draft pick, or as an undrafted free agent. “I try not to worry too much about it, because it’s honestly out of my control,” said the Timon-St. Jude High School alum, while appearing on Buffalo Sports Page Radio. Harris has had private workouts with the 49ers and Seahawks, and been contacted by at least nine other teams. That includes some interest from the Bills, where he took part in the team’s local prospects workout day. 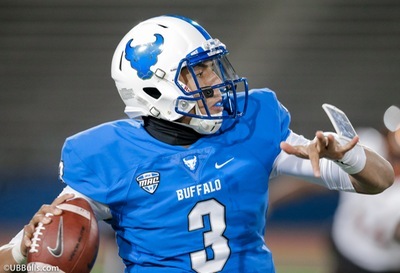 After walking on at UB, Harris worked his way to a scholarship and a two-year starter. Last season, as a senior, was Harris’ best. He had 55 tackles, 5 sacks, 9.5 tackles for loss and earned 2nd Team All-Mid American Conference honors. “It’s been a process,” he said, “I’m not going to lie to you. Making that transition from basketball to football, it was kind of cool. Instead of being a short Division I basketball player, I’m one of the taller prospects. Harris is six-foot-four, 265 pounds…ideal size for an NFL defensive end. The Bulls have had a player drafted in three of the last four years, including Harris’ former teammate Khalil Mack. But it’s the player drafted last year in the seventh round who has helped Harris the most. As for his plans over the weekend, Demone will be watching the Draft. But he has just one priority.